Caisse d'Epargne's Vladimir Karpets of Russia took the overall in the Volta a Catalunya Sunday, edging out Michael Rogers and Denis Menchov. Euskaltel's Samuel Sanchez won Sunday's stage, 5 seconds ahead of Astana's Alexandre Vinokourov and 9 seconds ahead of a group featuring the GC contenders. 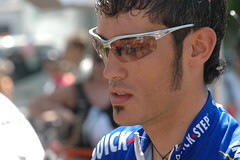 Karpets took the young rider's jersey in the 2004 Tour. Armstrong stomped his name all over this Tour today, taking his 5th individual stage win and nailing down an all-time record 6th consecutive Tour win. In the words of the local sportscasters, it wasn't even that close. Armstrong missed two other stage wins by less than a second, coming second to Fabian Cancellara in the prologue, and finishing less than a bike length behind CSC's Ivan Basso at La Mongie. His US Postal team also took the team time trial. As for Basso, he was unable to hold off Andreas Klöden of T-Mobile, who looks certain to continue T-Mobile's string of 2nd place Tour finishes. Basso trails Klöden by 21 seconds, but didn't lose enough time to fall from the podium, and will finish 3rd overall. Jan Ullrich, locked in 4th, will finally learn what it's like to finish off the podium; in 6 prior appearances, Ullrich has a win and 5 2nd-place finishes. French hero Thomas Voeckler will have to content himself with a closet full of white and yellow jerseys earned during the Tour. Illes Balears-Banesto's Vladimir Karpets beat him by 6+ minutes in the time trial to take over the white jersey for best rider 25 or under. US Postal looks ready to ride another week, as 5 Postal riders were in the top 11 on the day: Armstrong 1st, Floyd Landis 4th, Jose Rubiera 9th, Jose Azevedo 10th, and George Hincapie 11th. Only Rabobank and US Postal still have all 9 riders in the race. After Stage 19 Saturday, Armstrong admitted that next year's calendar had yet to be determined. 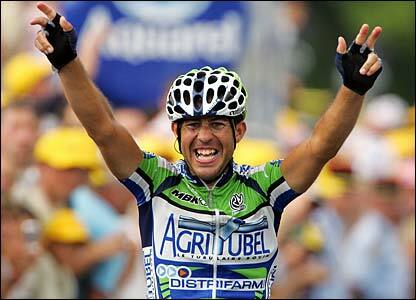 But he also said this: "The Tour de France is the race that matters the most. And it's the one that I love the most." "I can't imagine not being here." And how about Bobby Julich, 5th on the day?